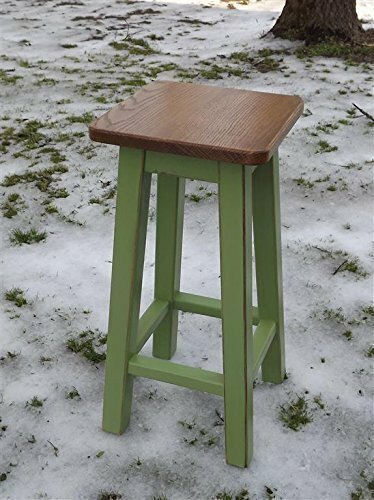 Custom built, brand new, stained top, painted your choice of color's, distressed base, wood counter/bar stool. The real deal! Solid wood, no particle board! Solid oak top is stained walnut and sealed with clear polyurethane. Base is painted in your choice of painted color's, Additional picture's show paint choices. Base color's choices are Colonial red. Black. Heirloom white. Turquoise. Green, Yellow. Espresso brown. Light gray. California Lilac (purple). Then distressed! Perfect size, measures 13" x 13" seat, x your choice of 25"- 28"-30" inches, high. LIFETIME STOOL! Will hold 300 lb plus! All are stools are Kreg screw hidden constructed for solid, stability, and years of use. No face nails or hardware showing! THESE STOOLS ARE MADE TO ORDER! KNOW YOUR HEIGHT'S! RECOMMENDED HEIGHT'S. 10' TO 12' INCHES BETWEEN SEAT HEIGHT AND COUNTER OR BAR HEIGHT!